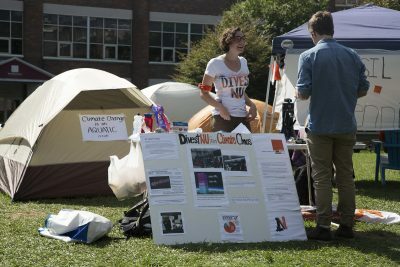 A Northeastern University student group organized a protest on Northeastern’s Centennial Common to protest the university’s continued investment in the fossil fuel industry. The protest began Monday morning and continued through the day with 40 students saying they would spend the night, according to one of the student organizers, Ben Vanderlan. The protest was organized by a group on campus called DivestNU, which is a coalition of 30 student groups on campus led by a team of 10 students, according to Vanderlan, a sophomore at Northeastern. During the protest, the group put up signs with slogans such as, “climate change is a women’s issue,” “climate change is a youth issue” and “climate change is everyone’s issue,” to demonstrate the scale of the problem. DivestNU claims the university is hypocritical, since it continues to invest in the fossil fuel industry, despite promoting an image of sustainability, according to Vanderlan. “We think that Northeastern as a sort of a self-proclaimed global leader in sustainability has a duty to put its money where its mouth is and not invest in companies that are causing potentially the destruction of the planet,” Vanderlan said. The coalition also wants to stress the fact that the former vice president of ExxonMobil, Edward Galante, is a vice chair of Northeastern’s Board of Trustees, Vanderlan explained. ExxonMobil is currently under investigation for potential fraud and their role in orchestrating a campaign of climate deception, according to a press release from DivestNU. While DivestNU is not calling for Galante’s removal from the Board, they want to ensure that his role is not affecting the university’s decision in concern to fossil fuel divestment, Vanderlan said. “We feel that his presence on the board could lead them to not objectively address the issue of fossil fuel divestment,” Vanderlan said. Tyler Hall, a fifth year senior at Northeastern and a founding member of DivestNU, explained that the group has been fighting against the use of fossil fuels since 2013, but the university has not always been consistent in their position. “This past March, [Northeastern’s Social Impact Council] released a report that was very much in favor of divestment, which we were all pretty psyched about because we had spent a year trying to push this thing along and then finally we got the result that we were looking for,” Hall said. However, Hall said, in the university issued a response to the report in July explaining they would not be divesting. That statement was what prompted DivestNU to begin planning more drastic responses in order to urge the administration to listen to the student body and divest, according to Hall. “We feel that their treatment of us thus far has been too dismissive for the amount of student support there is,” Hall said. Several Northeastern students involved in the occupation said they want the university to divest because they said fossil fuels negatively impact people around the world. Northeastern freshman Nebai Hernandez said he got involved with the action to advocate for those who can’t stand up for their own interests. 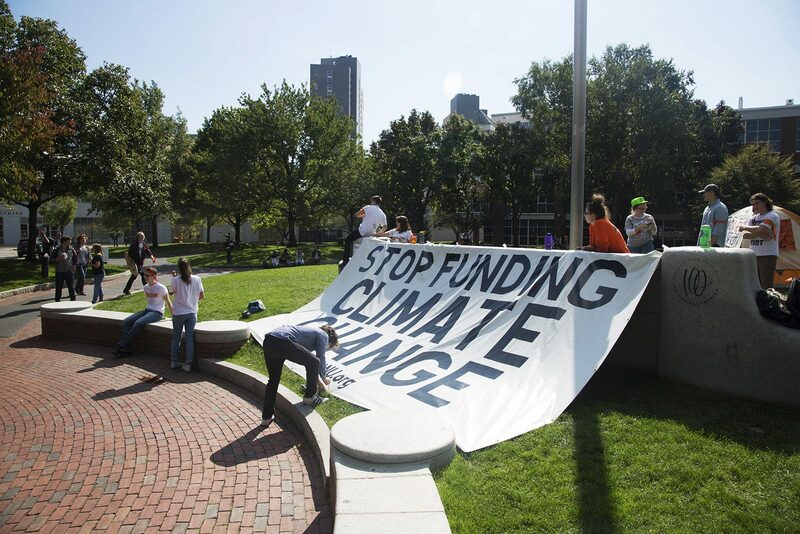 Austin Williams, a senior at Northeastern, said although student groups like DivestNU might not be able to end the fight against climate change, they can at least lead the charge.